The term pulled hamstring refers to a strain in at least one of the hamstring muscles. This happens when the muscle fibers are stretched suddenly, and can occur from many activities, including kicking, running, or even simply walking down stairs. In severe cases, the muscle is torn, and there's a popping sound. The area usually becomes swollen and tender soon after injury. There may also be muscle weakness, bruising and discoloration on the back of the leg, and the patient may be unable to place weight on their leg. Read on for tips on how to achieve pulled hamstring recovery. How Long Does It Take to Recover from a Pulled Hamstring? This heals within about a week. There is not much pain, walking doesn't hurt, and there is no motion restriction. However, ensure you rest your leg and avoid exercise. If you return to physical activity too soon, you risk exacerbating the injury. After one week, you can increase the workload and stress you place on your leg. For grade 2 injuries, 2-3 weeks' recovery is needed. Don't overload your leg during recuperation, as this increases healing time. 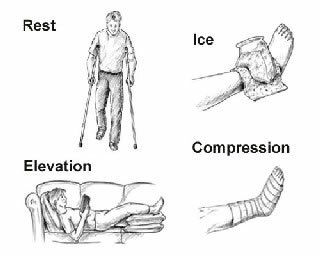 This level of injury limits range of motion, causes pain when you walk, and gives rise to tingling and pulling feelings in your leg. Avoid exercise until these symptoms have nearly disappeared. Complete recovery from this level of injury will take 3-5 weeks. There will be marked swelling in the hamstring area and you usually can't walk anywhere without some form of support, such as crutches. Avoid all physical activity during the recovery; otherwise the muscle will get injured again. Rest. Try to limit moving your leg as much as possible, and avoid exercise. In serious cases, your doctor may advise you to use crutches. Ice. Make a cold pack, for example by wrapping a bag of frozen peas in a tea towel. Apply this every 2-3 hours for 15-20 minutes. However, don't use ice directly on your skin. Elevation. To diminish swelling, keep your leg raised as much as you can. Support it using a pillow. Compression. Any movement or swelling can cause further damage to your leg, so limit this by compressing your thigh. You can buy simple elastic and elasticated tubular bandages from most pharmacies. Oral over-the-counter painkillers can decrease swelling and inflammation. You can also use creams and gels containing painkillers for pulled hamstring recovery. Lie down on the ground facing up. Raise your injured leg straight up to rest against a wall, pole, or doorway. Your unaffected leg will be either straight on the floor if you're using a pole or doorway, or bend if you're using a wall. As you improve your strength, you'll be able to get closer. Sit on a wheeled stool/chair. Extend your affected leg in front of you with the heel remaining on the ground. Gradually bend the leg's knee to move the chair/stool forward. Repeat this until you're able to cross the room this way. Where Is the Hamstring Located on Your Body? 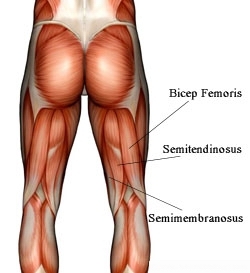 Your hamstring consists of three muscles in the back of your thigh – the semimembranosus, semitendinosus, and biceps femoris. These enable you to bend and flex your knee. To attach to bones, the muscle fibers gradually turn into tendon fibers at either end. One end of the hamstring tendon inserts into the pelvic ischium bone, the hamstring runs down the femur, then the other tendon attaches to the fibula and tibia bones after crossing the back of the knee. A small section of the hamstring also stretches over the hip joint to aid hip extension. Balancing the hamstrings are the quadriceps muscles at the front of the thigh; these are involved in knee extension. The hamstrings and quadriceps work together to provide stability and power to the knee. This enables you to do many physical activities, including walking, running, squatting, and jumping. How Does a Pulled Hamstring Happen? Previous hamstring damage. This can lead to recurrent injury if the muscle hasn't completely healed. Activities such as skiing, ice skating, and weightlifting require quick muscle contractions to produce bursts of speed. These contractions frequently cause what are known as avulsion injuries to the hamstring. How Can You Prevent Pulling Your Hamstring? Establish a regular stretching routine. Warm up and stretch before performing any sporting activity. Prevent electrolyte imbalance by eating a balanced diet. Drink plenty of water to prevent dehydration. Insufficient fluids can cause muscle cramping, increasing injury risk. Maintain a healthy weight to lower the chances of injury to the lower leg muscles. Nutritional supplements, for example antioxidants, may help to prevent injury. Your hamstrings are naturally much weaker than your quadriceps. Improve the situation by strengthening your hamstrings with the combination of exercises such as targeted hamstring resistance training and horizontal power moves, e.g. single leg broad jumps. Why Do You Have Painful Legs While Lying Down? What Does It Mean When Your Ribs Hurt?